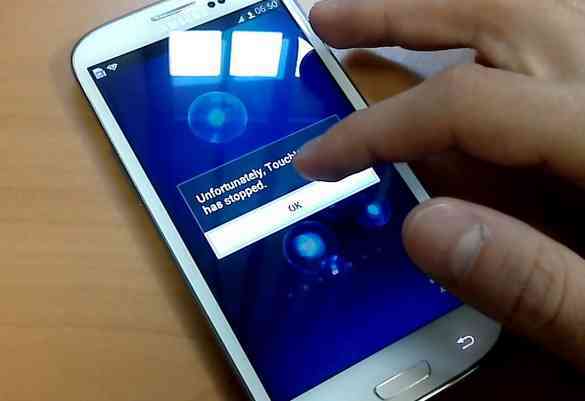 Are you sick and tired of getting the error message 'unfortunately TouchWiz home has stopped' on Samsung? You’ve tried everything but this problem that is prevalent on Samsung smartphones like the J1 mini prime, J2, J3, J5, Galaxy S3, S4, S7, Galaxy A5, and Galaxy Tab has got your head twisted in a nut. Your phone gets unresponsive and then the display message keeps coming back over and over again even after clicking on 'ok''. The Samsung TouchWiz problem tends to make all running apps, tasks, and processes stop automatically or freeze, meaning you can easily lose data that has not been saved. Irrespective of your device, how can you solve the TouchWiz home has stopped or com.android.phone has stopped problem? The first thing anyone might try doing is to reboot or restart their Samsung smartphone on encountering this error. Although this might help, it is only a temporary solution for one of the common Android errors. In that regards, we have outlined several ways to resolve the TouchWiz home has stopped issue and restore normalcy to your device. TouchWiz Home is Samsung's launcher that provides a Home Screen and App Screen for devices in the Galaxy series. Samsung's TouchWiz Home features include an inbuilt Theme and Wallpaper to allow the user customize their display, it gives users ability to move multiple apps at once, and comes with a Secure and Game Launcher. Even though this may be exciting for some users, others would rather find ways on how to get rid of the TouchWiz easy Home. What Causes Touchwiz Home Has Stopped Problem? Displayed error message, 'Use Touchwiz Home as Home'. Displayed error message 'Complete action using Touchwiz'. TouchWiz crashes when moving apps to folders and displays error message. TouchWiz crashes when uninstalling apps and displays an error message. Then here are some reasons that might be the likely cause of the error messages, occasionally freezes, and lagging of your Samsung. Each time you update your OS from an older to a newer version and vice versa, the old data from the former OS is automatically deleted and the new system files are loaded into memory. If the old data has not been deleted automatically as is expected, it will lead to system crashes since both will conflict while running at the same time. You may notice this problem when you launch a particular app on your smartphone or right after you update your Samsung's OS. The launch of a new app or an existing app can cause Touchwiz to crash frequently. If it is an existing app, then they need to be improved upon to ensure they work with the new OS, while a new app on the other hand, might be taking a lot of your CPU's memory. If the app requires a lot of CPU resources to run, it'll put a lot of load on the memory and if your phone is not as powerful to handle it, what comes next may be an error message. 3. Error Caused by Installed Widgets. Just like bugs on Samsung that can be caused by apps, the same is the case of pre-installed widgets. Some may require an update to a newer version to run well, and others may not as a simple device reboot is enough to restore normalcy. If you recently updated your device's OS, there could still be corrupt data in memory that can cause the error to pop up each time you want to add a widget to your home screen. 4. Allocation of Resources for Gestures and Motions. Often times, the most common reason why the problem occurs is If TouchWiz is unable to allocate resources required for Motion.Gestures. The steps outlined below will help you to fix the Touchwiz Home Has Stopped problem on your Samsung phone. Clear device's cache memory and data..
Navigate to your device's Settings. 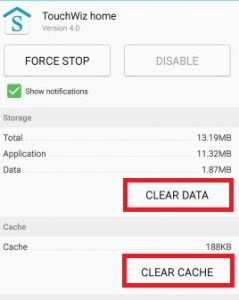 This step is necessary because it will check if this problem is caused by the data in Touchwiz's cache and the action of third-party apps. On booting, immediately release the Power Key and hold the Volume/- button instead. Do not release the Volume Key until the device has booted fully. On completion, you'll know the device is in safe mode with the notification at the lower left corner of the screen. If the TouchWiz error problem does not occur while you're operating the device in safe mode, then you can be sure it is caused by the data in memory which needs to be cleared. That being so, you can proceed to the next option below. 3. Clear device's cache memory and data. Clearing TouchWiz's cache and data will reset the Homescreen and remove the widgets you've manually placed there. If TouchWiz Home is not your default Launcher, in this case, you need to select the third party Android Home Launcher (Google Now or Nova Launcher etc.) you are using and clear its cache and data. If the error is not eliminated, you can try the fourth option below. To change the Animation scale on Samsung, you need to access your device settings as a developer. Move to the Drawing section and slightly adjust each of the values for Window Animation scale, Transition animation scale, and Animator duration scale. Finally, Reboot your device to see if the error persists. The last two options should only be carried if none of the above solutions work for you. Before you wipe Samsung's partition, keep in mind that you will lose the files stored in memory, and as such, a backup should be done before you proceed. Hold the Home Key, Volume/+ Key, and Power Key simultaneously while the phone is off. On vibration, release only the Power Key while still holding down on the other two. On the Android Recovery, use the Volume/- Key to Navigate to 'Wipe Cache partition'. Select the option using the Power Key. On completion, select the option 'Reboot system now'. A factory reset will clear the data stored in memory and also change the settings of the phone to default. On the Android Recovery, use the Volume/- Key to Navigate to 'Wipe data/factory reset'. Use the Volume/- key to highlight the option 'Yes delete all user data'. And these are the complete steps on how to fix 'Unfortunately Touchwiz Home Has Stopped' error message to get your Samsung smartphone working normally again. While one may work for the other, it may not work on another due to different Samsung models and Homescreen Launchers. Try each and see which works best to help you resolve the TouchWiz issue permanently.